Sometimes ingredients make strange bedfellows. Chocolate and cheese are not the most natural mates, but when the cheese is a heady, acidic, barnyard-fresh goat’s milk cheese and the chocolate is bits of roasted cocoa bean, unsweetened and compact as an espresso bean, unexpected things happen. You get something more. But you can’t quite tell what. The flavors square off then shift, then subvert one another. Then they take a pause. The air is thick with tension, but nothing stirs. Suddenly, like a gunshot comes the massive crunch of Cyprus black flake sea salt and everything is movement. It all becomes clear in an instant: a dish that’s as comforting as grandma’s chicken potpie and yet uncivilly decadent…. A secret pleasure of serving this dish is watching even the most well-bred guest slyly supplement each bite with an added pinch of black salt crystals. 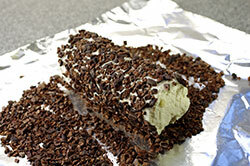 Spread the cacao nibs in a single layer on a sheet of foil. 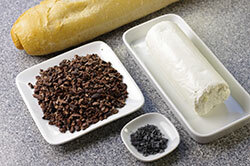 Roll the log of goat cheese carefully in the nibs so that cheese doesn’t stick to your fingers. 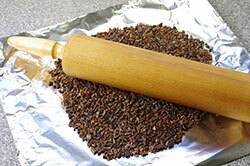 Once the cheese is well coated, roll the log with a little more pressure to embed the nibs into the cheese. Place on a serving plate. Sprinkle the cheese with salt, allowing the crystals to tumble across the plate. 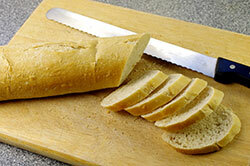 Cut the baguette into thin slices and arrange them around the cheese log or place them in a basket to serve alongside. 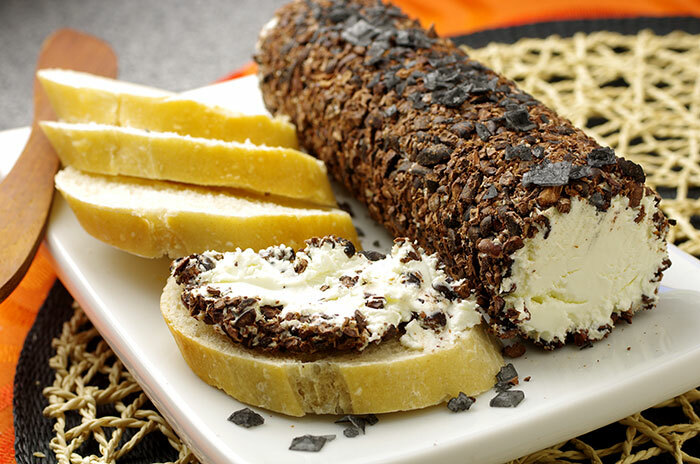 To show guests how to serve themselves, cut a round of cheese from the log and place it on a slice of baguette; top with a few of the scattered chunks of black salt. Recipes from Salted by Mark Bitterman. Published by Ten Speed Press, Berkeley, CA. Copyright 2010. Reprinted with permission of the publisher. All rights reserved.